New email arrivals display a small preview of the message itself on the lock screen of iOS devices, which shows the sender, the subject, and part of the actual email message body. 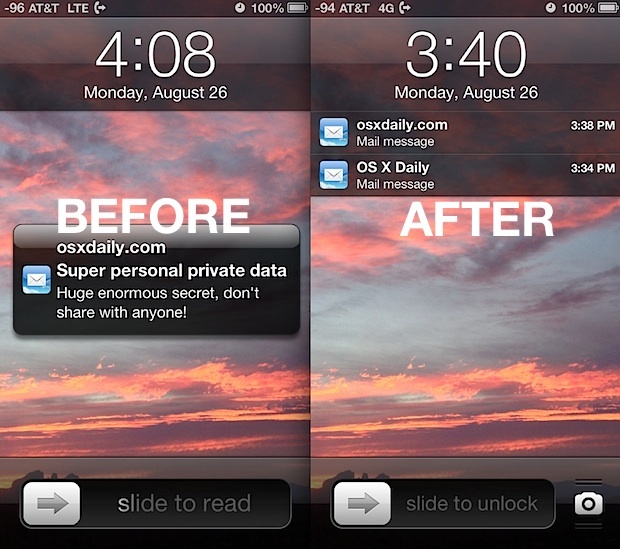 Because emails can contain some very private and/or personal details, you may wish to hide those email message previews from showing up on the lock screen completely. This will not completely prevent email notifications from appearing on the lock screen or Notification Center of iOS devices though (you can do that too, if you prefer), instead this just adds a nice layer of privacy by not showing the email preview. You’ll still be able to quickly tell that you have a new message and you’ll continue to see the sender of the message, but onlookers will no longer get a preview of the message subject or body content if they happen to see the lock screen of your iPhone, iPod, or iPad. With the mail preview turned off, only the sender will be revealed, and all subjects and message body previews will be replaced with a simple “Mail message” text. You can do this for iMessages and text messages too, which is also recommended if you are looking to bring some additional privacy to your locked iOS devices.